John "Jack" Fowler has been a busy radiation biology researcher and teacher. He has written 581 paper over the last 65 plus years. He has also received nearly every honor the medical physics field can bestow. But Jack is not done. He says it is time he wrote a book. 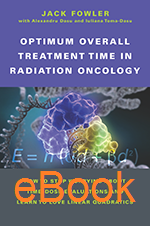 Jack's new book sums up the key concepts relating to optimum fractionation in radiation therapy that have interested him all these years. Just under 100 pages in length, this book is a quick, informative, and enjoyable read.